Valve’s SteamVR Tracking system is great for VR but certainly not limited to it. 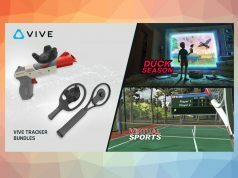 For developers, hackers, researchers, and more who might have use for an inexpensive high accuracy, low latency, 6 DOF positional tracking system, it’s possible to use the new Vive Trackers or controllers (even with a single base station) without needing to shell out for the full $800 Vive system. Beno runs Triad Semiconductor’s Arctic VR Lab (aka Triad’s Green Bay Lab – Go Pack!). 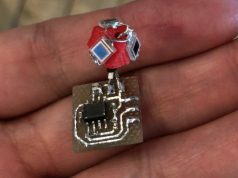 Triad Semiconductor worked with Valve Corporation to create the Light to Digital Converter ICs (TS3633) for SteamVR Tracking. Beno speaks Python and English and his office smells of solder and 3D printing. 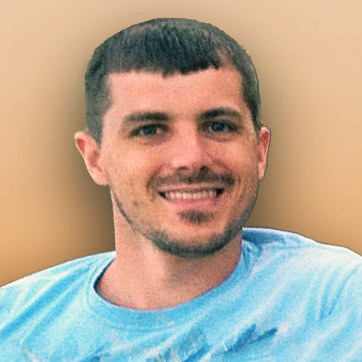 He spends his days and nights ensuring that SteamVR Tracking ICs and systems provide precision tracking and he supports SteamVR users around the globe with the development of Tracked Objects. The purpose of this tutorial is to provide step by step guidance on how to get started with SteamVR Tracking 6DOF positional tracking for as little as $235. In this tutorial, the latest version of SteamVR Beta, is coupled with python 3.6, the pyopenvr library and the triad_openvr Python wrapper. When SteamVR restarts, you will see that it is now possible to connect a tracker or controller without the HMD. As the script executes, you will see numbers updating at 250Hz. These are the realtime 6DOF pose coordinates! The purpose of this tutorial was strictly to provide a quick proof of concept that demonstrates that an HMD is in fact not a requirement for use of SteamVR. Python is an extremely extensible language and this example code may provide a basis for many derivative projects. These same concepts also easily apply to other programming languages such as C, C++ C#, etc. If you have any questions or would like to share your project based on this tutorial, please contact us at info@triadsemi.com. Like you have identified and the doc-ok article also suggests, there are performance differences between one and two Basestation tracking. The point is that just one basestation is a valid configuration and is a way to get started. For some non-VR applications, possibly this performance is acceptable so as a minimum requirement, you could get started with just one. but practically speaking at some distance from basestation, say 12 feet, just how good is it to be useful with just one basestation ? 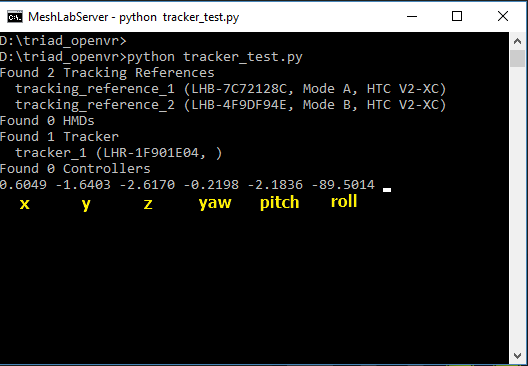 Well out of curiosity I ran a test by mounting a tracker to a tripod and placed it 4060mm away from Basestation A and 3048mm away from Basestation B. I then used this triad_openvr python code to acquire 60 seconds of tracking data sampled at 250Hz. First run was with both basestations running, then again with only Basestation A running. So my conclusion is that the impact of Jitter for 1 basestation vs 2 could roughly be as much as double BUT that the overall tracking performance is still very useful for many applications and no where near 10mm. So in layman speak… .. this is.. good? bad? Sorry… In my opinion both 1 Base and 2 Base performance is good! why do people pay for second base station then ? why would they want to pay for NoloVR ? why NoloVR exists in the first place ? For the reason you refuse to believe. When they’re turned away from the basestation the second one can see. Just face facts, you’re wrong. Would you happen to know whether you can set up a play space without the HMD with only the trackers? I mean setting up two base stations somewhere and getting tracking up and running with just one tracking puck. Great question! I ran an experiment where I took a basic laptop (Win10, Core i5 with Intel Integrated Graphics). Installed Steam and SteamVR and tried exactly this. Room setup was not required at all. I believe that this is more for telling the Chaperone what direction to face, where the floor is and what the bounds of the room should be. In my experiment, it seems as simple turn on the basestation, turn on the tracker and start getting coordinates. When you do this, it seems that the origin of the coordinate system is the location of the Mode A basestation and the best I can tell, it tries to align orientation with with gravity. This probably means that for your application, you would have to have a scheme to pin this coordinate system to whatever you are wanting to track in the real world. That’s great news, I was carefully optimistic that the calibration was exactly that, ie. just for knowing where the floor is and setting directions. Thanks a lot for testing this. triad_openvr seems really useful, too. I have played around with pyopenvr and got things running but anything making it more convenient is a huge plus. Thanks for the effort, hope you guys at Triad keep this great level of support for working with the tech up! We’re happy to help and inspire more people to be innovative with use of the Tracking Technology. pyopenvr is a great start and an excellent base layer, the goal with triad_openvr is to make the interface more intuitive/natural to use and pythonic. You (and anyone else) are welcome to contribute to the github to add the features that you want too! The only real reason for two base station is occlusion (especially users’s body occlusion). There are some use cases for 6dof tracking that don’t involve humans, so oclussion may not be an issue. Have you tried it with just one basestation (at 3 m distance)? I would imagine it would work fine if I wasn’t turning around and around. it would be an interesting test. I read one works fine for sitting games, even Eve Valkyrie but I doubt it’ll be any good with say Arizona Sunshine. It would be an interesting test, I’ll try it when i get a chance. I thought you were actually interested if one light house works I didn’t realize you were an oculus fanboy just trying to tear down vive and lighthouses. But for reference here’s a video. You read one article and that’s all you’ll believe but real world tests seem to confuse and anger you. Doesn’t change the fact you’re ignoring real world results. You’re a terrible researcher. Your professors would be ashamed of these posts. But I was premed so I took my fair share of physics and math courses. You did mean you have degrees in math and physics right? Not that you took some math and physics courses in college did you? Because that would be embarrassing on your part. Could the timing between the laser line sweep hitting adjacent photodiodes be used to get Z, if the receivers are fast enough? See my response below for actual test data. The pricing the author lists is misleading. If you want a roomscale front facing experience, here is the actual cost. The pricing is just for tracking one object… just like it says if you could read. Total Cost: $235… just like it says. This is great info, thank you! 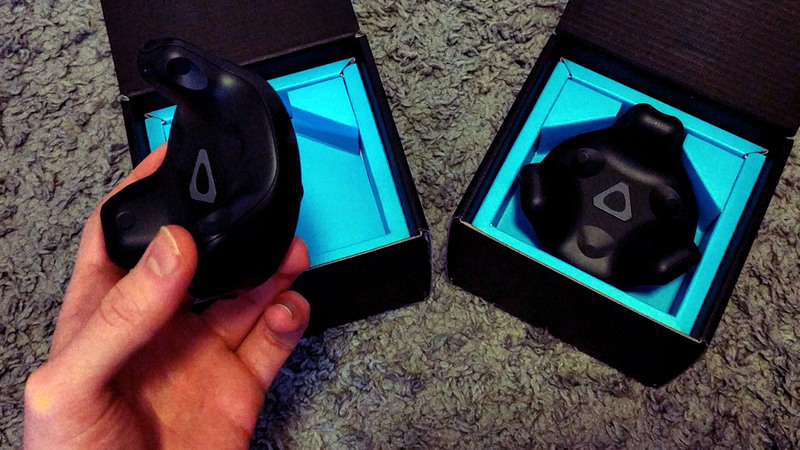 Does anyone know if it is possible to use two Vive controllers with one Steam dongle or do I need one dongle per controller? I’m looking into using my two controllers without having to connect the HMD for non VR applications. This is way overcomplicated. You can use the tracker, the controllers, even play whole VR games without using the headset. Just use your imagination, bro. I Own the vive, but I’ve also ordered the pimax 4k. 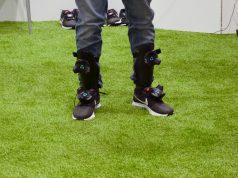 Does this allow me to strap the vive tracker to the pimax and track it just like the vive HMD? A few notes since this is vaguely out of date. To install SteamVR with beta, install SteamVR using steam. there is a typo saying text rather than test. Also, you need to connect the controller via micro-usb for it to work. This is stated, but would be good in bold. If I disconnect my HMD how will I get data from LightHouse stations and my controllers to my PC? 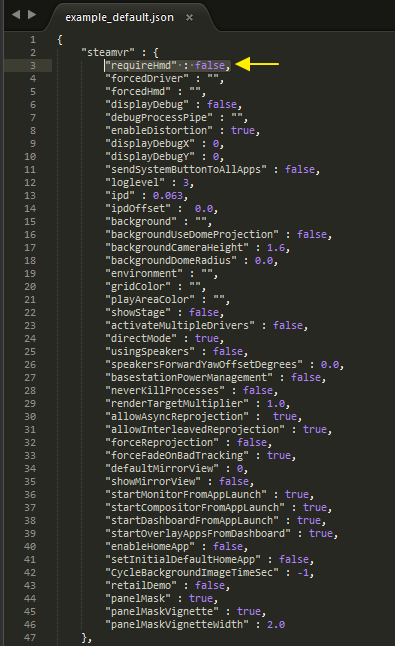 I just tried this, this is very cool but still I dont get why, if I use the vive tracker, if I rotate it around the Y axis it changes my PITCH and not the YAW as it should be. Any idea?